Music Cities Convention will begin with an official opening reception at the Blue Moon Saloon, with live music, and food & drinks provided for all convention attendees. The official launch reception will then be followed by the famous weekly Cajun Jam event, lead this time (especially for us) by a Grammy winning musician! Convention Delegates will be treated to great Cajun and Creole cuisine that has helped Lafayette garner the title of Tastiest Town of the South by Southern Living Magazine and Best Food City in the U.S. by Rand McNally and USA Today. After the talks on day one, we’ll be taking everyone over to Warehouse 535 for an evening of live music! To start the evening off, we’ll have dinner provided by Bon Temps Grill, an open bar and music provided by SOLO showcase artists. Festivals Acadiens et Créoles presents in collaboration with Lafayette Convention & Visitors Commission, the CREATE Initiative, South Louisiana Songwriters Festival (SOLO) and Festival International de Louisiane a special evening of local music as part of Music Cities Convention. Many of the musicians featured on the upcoming “Lyrical Legacy of Caesar Vincent” album will be playing their own songs, in addition to those inspired by the late Cajun balladeer. Nearly 30 musicians will take the stage and include Zachary Richard, Jourdan Thibodeaux, Cedric Watson, Kelli Jones, Joel Savoy, Sean Bruce, Megan Brown, Steve Riley, Sam Broussard, David Greely, Julie Williams, Tiffany Lamson, Lil Buck Sinegal, Sir Reginald Dural, Chris Stafford and more. Doors open at 6:30 p.m. 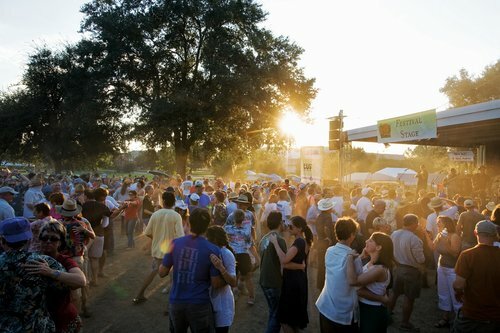 There will be a focus not on just Cajun and Zydeco of the region but music genres that truly make Lafayette a Musical City! The Lyrical Legacy of Caesar Vincent will be available for sale that evening as well as during Festivals Acadiens et Créoles Oct. 12-14. There will also be a special set of music featuring different musicians from the record on Saturday at Scene Mon Heritage from 2:30 to 3:30 pm and a full-length concert of songs from the album is scheduled in 2019. The convention will end with the start of the amazing Festivals et Acadiens et Creoles. At 5.00pm, there’ll be a live Boudin cutting to launch the festival, live music will then follow with all convention delegates also being invited to use the Music Cities Convention VIP tent as their base for the night, with drinks and dinner provided. The Music Cities Convention VIP tent will stay open over the weekend, with lunch and drinks provided on Saturday and drinks provided on Sunday.